Here is a look at some of the week’s top high school sports events. Monday — Legacy at Cheyenne, 6:30 p.m. The Desert Shields were the Class 3A state runners-up last season, but move up to Class 4A this season. They’ll get a home game to kick off the season. Tuesday — Foothill at Canyon Springs, 6:30 p.m. The Falcons opened the season ranked No. 6 with Canyon Springs No. 7, so this should be a good early-season test for both teams. 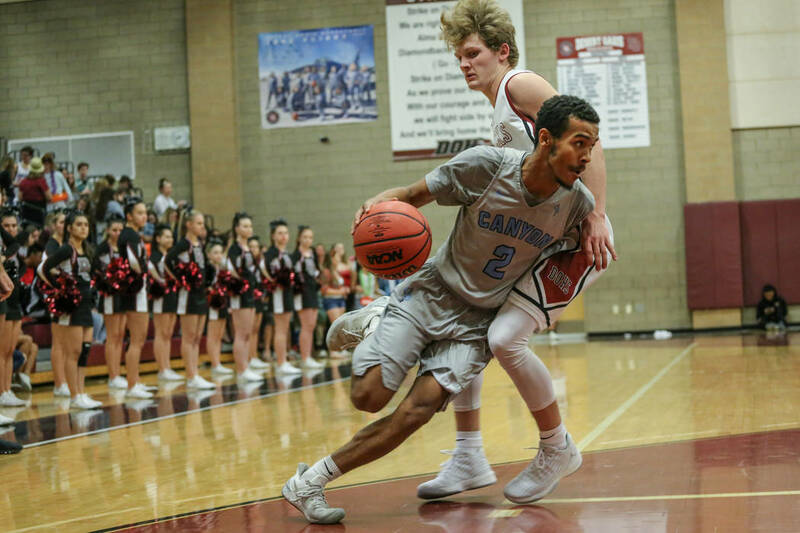 Two of the area’s top guards will be on display in Foothill’s Jace Roquemore and the Pioneers’ Alexander Spaight. Thursday — Coronado at Bishop Gorman, 6 p.m. This could be a postseason preview as the top-ranked Gaels host No. 2 Coronado. Returning all-state players Jaden Hardy (Coronado), Noah Taitz (Gorman) and Isaiah Cottrell (Gorman) will be on display. Defending champion Democracy Prep returns to highlight the field. Returning all-state player Najeeb Muhammad will lead the Blue Knights. Play begins at 4 p.m. on Thursday with Saturday’s championship game scheduled for 7 p.m.
Tuesday — Desert Oasis at Cimarron-Memorial, 5 p.m. The third-ranked Diamondbacks will try to ride their strong low-post game past the 10th-ranked Spartans. Tuesday — Foothill at Canyon Springs, 5 p.m. The sixth-ranked Pioneers are coming off a championship at the Liberty Thanksgiving Invitational, and will try to ride that momentum against seventh-ranked Foothill. Friday — Clark at Faith Lutheran, 6:30 p.m.
Marieka Dent and the Chargers look to start the season strong against a Crusaders team that finished third at the Liberty Thanksgiving Invitational. Monday — Bonanza at Green Valley, 4:30 p.m. The Bengals, who advanced to the Sunset Region semifinals last season, will try to open the season on the right foot against a Green Valley squad that finished second in the Sunrise Region. Wednesday — Coronado at Sierra Vista, 4:30 p.m. The defending Class 4A state champions open the season on the road against a Mountain Lions squad that advanced to the Sunset Region semifinals last season. The annual early-season tournament features games on Friday and Saturday. Foothill, Clark, Las Vegas, Legacy, Moapa Valley and Rancho are scheduled to join host Virgin Valley. Saturday — Bishop Gorman vs. Bishop Manogue at Sam Boyd Stadium, 12:10 p.m. The Gaels are seeking their 10th consecutive state championship but will have to top the state’s other large Catholic school. The Gators, who had their streak of six consecutive state championships snapped last fall, host their annual dual tournament, which begins at 3 p.m. on Friday.